Opening the new Coronation Street “lot”. “IT’S going to be hard to walk through that door for the last time. Veteran actress Barbara Knox is not the only one to shed a tear in Coronation Street: A Moving Story. Screened on ITV at 9pm on Thursday March 6, the hour-long documentary tells the story of the cast and crew’s farewell to the show’s historic site in Manchester. Then captures their excitement at the move to a scaled up but identical Weatherfield at Trafford / Media City. There has been the odd daft story this weekend derived from what both Barbara and Street creator Tony Warren say in the film. Barbara, who plays Rita Tanner, recalled ghosts from the past on an emotional tour of the Quay Street sets. “Some of the essence of us, our spirit or emotions, must be still in here,” she said on her last day of filming before the move to Corrie’s new home. Make your own mind up about the worth of that when you watch the documentary. Barbara, 80, first appeared – briefly – on the cobbles in 1964 as a friend of Dennis Tanner (Philip Lowrie) and became a regular cast member in 1972. She dabbed her eyes before shooting her final scene on The Kabin set. “My little kingdom. This is where I have spent some of the happiest hours of my life with some wonderful people. Co-star Philip, 77, who now plays her just departed screen husband Dennis, was one of 21 original cast members in the first episode on December 9 1960. 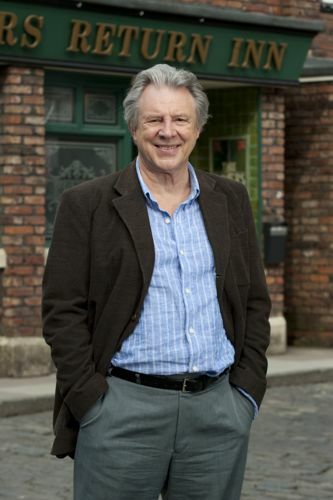 The documentary shows him visiting the Granada studio where Coronation Street began – walking through the doors for the first time in almost half a century. 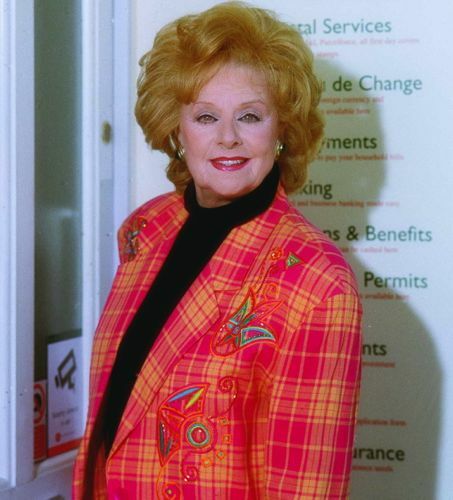 Having played the teenage son of Elsie Tanner (Pat Phoenix), he left Weatherfield in 1968, returned in 2011 and was seen leaving the Street with Gloria Price (Sue Johnston) in last Friday’s night’s second episode. A TV team spent two years documenting the rise of the new Corrie HQ at Media City where cast and crew began filming in early January. With the first episodes made at Trafford due on screen soon. The documentary also includes film discovered in the Granada archives and unseen for half a century. It features original Rovers Return licensees Jack and Annie Walker, played by Arthur Leslie and Doris Speed, filming on the original set. Tony Warren recalls how he drove around the streets of Salford with a designer and found the inspiration for the original Weatherfield. While cast members reflect on the move as they pack up their dressing rooms to head for the fifth version of the Street in its 53-year history. A lovingly made film and essential viewing for all Coronation Street fans. And yes. Best have that box of tissues handy. 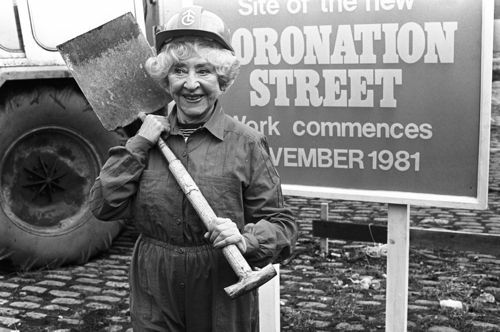 Doris Speed, who played Annie Walker, before a previous new Street incarnation. Posted in Coronation Street, News and tagged Barbara Knox, Coronation Street, Corrie, Dennis Tanner, Granada, ITV, Moving Story, Philip Lowrie, Rita Tanner, Tony Warren, Weatherfield. Bookmark the permalink.